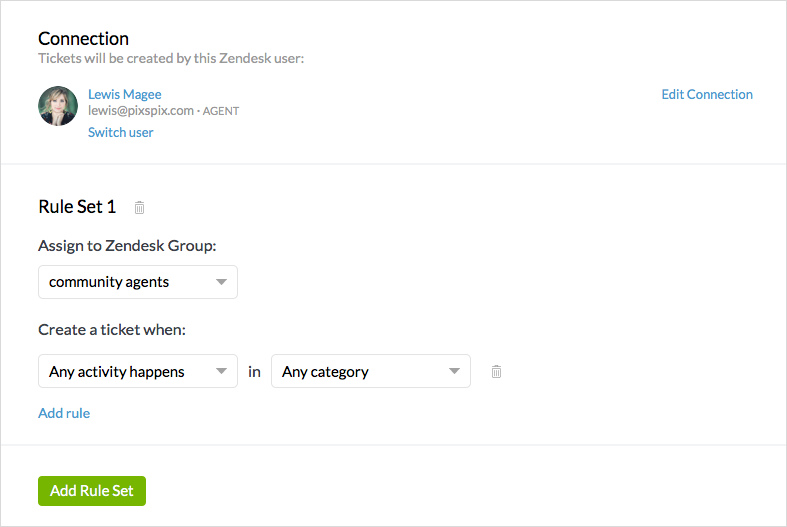 Are you using Zendesk for customer support and ticket tracking? Now you can have tickets automatically created in Zendesk when new questions or other activity is posted to your Forumbee community. You can create rules to assign tickets to specific groups of people, so that the right specialists on your team are notified and can respond. Tickets contain the full post and link directly to the community where the agent can post a response. After the agent answers a question in the community, customers may reply with additional questions in the same thread. 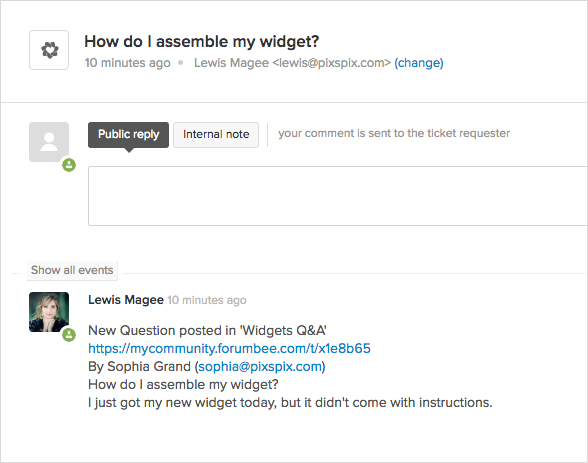 New replies are automatically added to the Zendesk ticket, keeping the conversation together, and reopening the ticket if it was closed. The ticketing process helps you track community activity and ensure questions are answered. It is helpful to note that Zendesk ticket notification emails are not sent to the customer who posted in the community. Customers will only receive email updates from the community when their question is answered, according to their community notification preferences. Is there any way to have Zendesk ticket updates communicated back to Forumbee? Hi CNB , thanks for your question! Currently, the communication is one way from Forumbee -> Zendesk, where the Zendesk ticket is always kept updated with replies that are added in Forumbee. We can track this as an enhancement request. What updates in Zendesk would you like to have communicated back to Forumbee? Forumbee Support Users create issues in Forumbee and those issues are transmitted over to Zendesk. (This is good.) Support engineers respond to those user issues in Zendesk (that's where they live) and the user is unaware because the response goes to the Zendesk agent that created the Forumbee-Zendesk connection. It would be useful if the response was transmitted back to Forumbee so the user could see it. Another option is to set the Zendesk user to the actual user that created the issue in Forumbee, in the first place (instead of the Zendesk agent). How about including the images that were originally in the post. Currently, these are manually copied across. Yakov Shaul Thanks for posting! We'll track your suggestion as an enhancement as well. Is there an update on a two way integration with ZenDesk? We'd like to have tickets updated in both directions and allow external customers to monitor ZenDesk status in a single ForumBee community. Hi Weston , thanks for your post! Two way integration isn't available yet--only one way (Forumbee -> Zendesk). Did this feature ever get created? I can see that it was requested a year ago. Hi Eric , thanks for writing in! 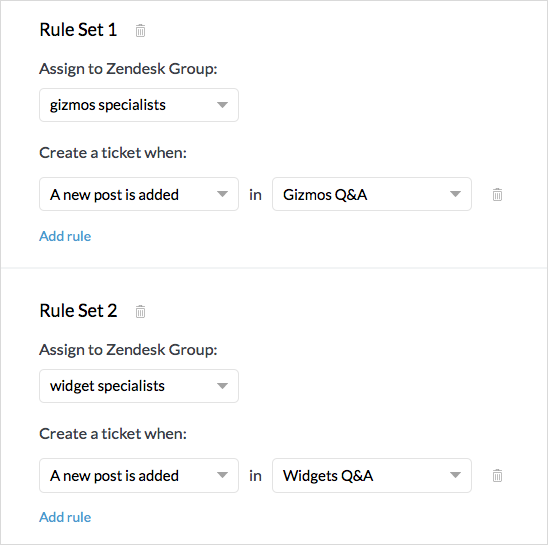 Zendesk integration provides the option to have a ticket automatically created when a new post is added in the community. The ticket continues to be updated if new replies are added to the post in the community, keeping your staff up to date in Zendesk. 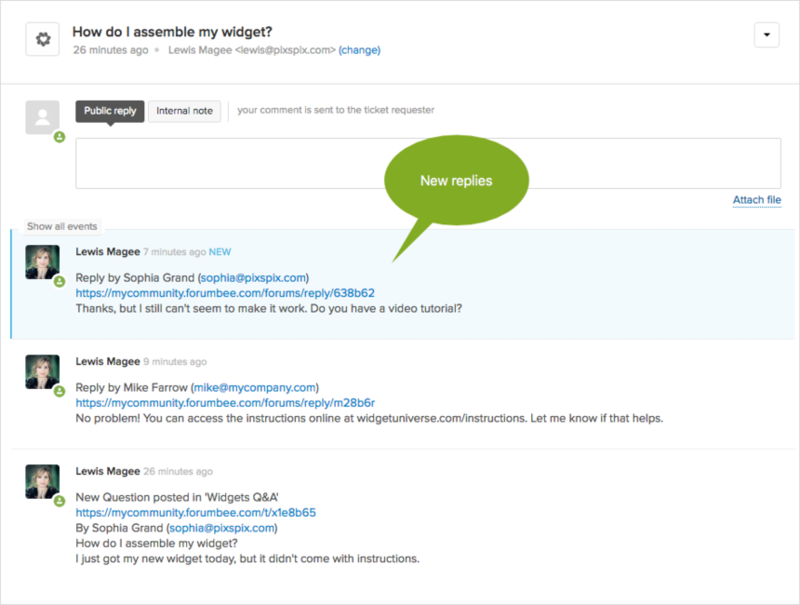 There isn't an option for a reply posted in Zendesk to be posted back in the community.